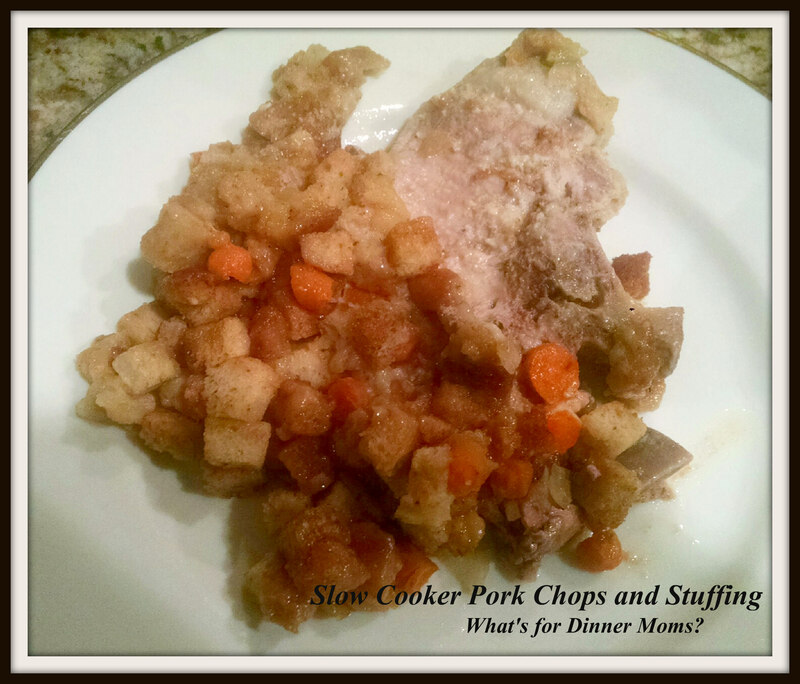 Slow Cooker Pork Chops and Stuffing (with NO canned soups) – What's for Dinner Moms? The other day I needed a quick meal to put into the slow cooker. I knew we had some nice thick pork chops in the refrigerator and a bag of leftover bread stuffing mix. The quick chop of an onion and some baby carrots mixed with some chicken stock made some delicious stuffing for the top of the pork chops. Just about every recipe I see for this dish uses canned soups. In less than 5 minutes I had a nice thick sauce that replaced the canned soups and tasted great! This makes a ton of stuffing but we LOVED it! This was another one of the dishes that leftovers were quickly snatched up for lunches the next day. We shredded the leftover pork and stirred it into the stuffing to put in a thermos for school. 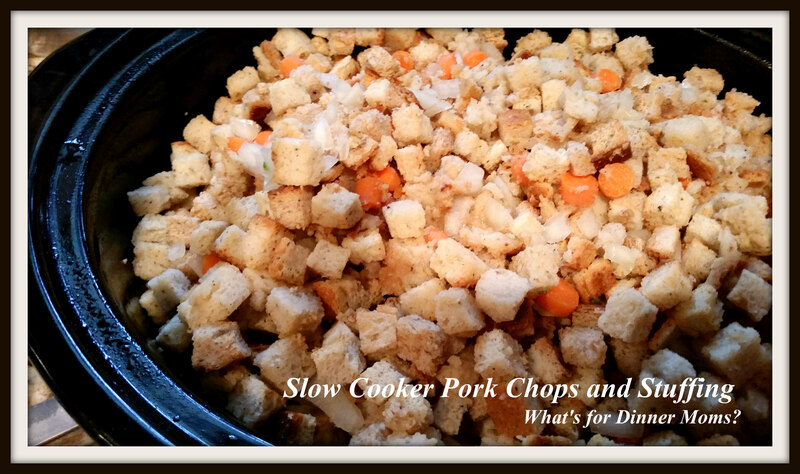 Place pork chops in bottom of large slow cooker bowl. In a large bowl mix together the stuffing, onion, carrots and 1 1/2 cups chicken stock. Allow the chicken stock to soak into the bread crumbs. In a saucepan over medium heat melt the butter. Once butter has melted sprinkle the flour over the butter and stir until smooth. Allow to cook for 1-2 minutes. Mixture will start to lightly brown. Add 1 1/2 cups chicken stock to mixture. Allow to continue to cook over medium heat until mixture thickens. This may take a few minutes. Once the mixture thickens add 1/2 cup of half and half and seasoning to taste. Stir well. Thin with a bit of milk if needed. Pour this over the pork chops. Top the mixture by pouring in the stuffing. The bowl of the slow cooker will be full. Cook on low for 6 hours. This can cook longer but your pork chops will start to fall apart the longer it cooks. Thanks. I will save this one, down-sized for two or three, perhaps. Frequently I take an extra serving to my 91 year old stepmother. She would like this. What a great down-home comfort meal! Easy too! Thank you! It was super easy. It was so simple! I ❤ stuffing!